"Welcome to the biggest, fastest, deadliest science book you'll ever read. Superlative is the story of extreme evolution, and what we can learn from it about ourselves, our planet, and the cosmos. It's a tale of crazy-fast cheetahs and super-strong beetles, of microbacteria and enormous plants, of whip-smart dolphins and killer snakes. This book will inspire you to change the way you think about the world and your relationship to everything in it." 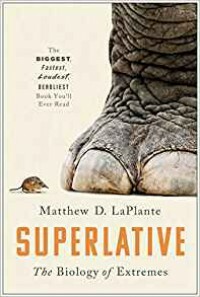 Superlative is a nicely written book about animal extremes and what studying these animals can offer us in terms of knowledge, technological innovations and medical advances. LaPlante takes a look at a variaty of organisms - the fastest, tallest, largest, loudest, smallest, oldest, toughest, slowest, most venomous, most poisonous, and the smartest etc. While the author's fascination with superlative animals and plants is clearly evident, so is his (and this readers) frustration with the lack of interest science shows in these organisms. While this book isn't terribly indepth, it does provide a delightful survey of a variety of creatures, some well-known and some more obscure, as well as how the study of these superlative organisms can benefit humans in a variety of ways - everything from climate change research and indicators (frogs and clams), to genetics and cancer treatments (elephants), new drugs (spiders, snakes, jellyfish), technological advances (moths, bats, mites and whales), bioindicators (frogs), regeneration of lost limbs (Axolotl), aging, etc. The conversational style of the book makes it easy to understand. The occassional humour is amusing and not at all cringe-worthy. The extensive reference section provides a list of sources if the reader would like additional information about a particular study or topic. "Authoritarianism is on the march―and so is dystopian fiction. In the brave new twenty-first century, young-adult series like The Hunger Games and Divergent have become blockbusters; after Donald Trump’s election, two dystopian classics, 1984 and The Handmaid’s Tale, skyrocketed to the New York Times best-seller list. This should come as no surprise: dystopian fiction has a lot to say about the perils of terrible government in real life. In Survive and Resist, Amy L. Atchison and Shauna L. Shames explore the ways in which dystopian narratives help explain how real-world politics work. They draw on classic and contemporary fiction, films, and TV shows―as well as their real-life counterparts―to offer funny and accessible explanations of key political concepts. Atchison and Shames demonstrate that dystopias both real and imagined help bring theories of governance, citizenship, and the state down to earth. They emphasize nonviolent resistance and change, exploring ways to challenge and overcome a dystopian-style government. Fictional examples, they argue, help give us the tools we need for individual survival and collective resistance. A clever look at the world through the lenses of pop culture, classic literature, and real-life events, Survive and Resist provides a timely and innovative approach to the fundamentals of politics for an era of creeping tyranny." 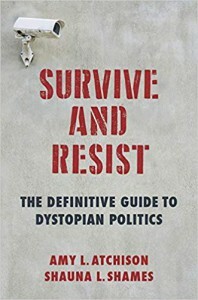 Survive & Resist is an interesting, easy-to-understand book that uses a selection of more popular dystopian fiction (film & novels) to explain and make sense of key political science concepts, such as the study of government, governance, state power, public policy, people's political behaviour, the role of economics, and social movements. The author's use dystopian fiction to explain what good governance is supposed to look like and how to resist bad governance. The book also includes a chapter on the strategies and tactics used by dictators to achieve and maintain their power; and chapters on how to survive or resist a dystopian state, as an individual and as a collective resistance group/movement, with an enphasis on non-violent resistance. 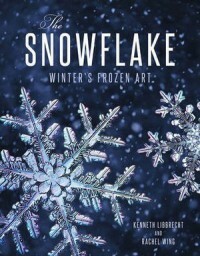 The author's also cover how to rebuild society after the collapse of a dystopian government. The book provides food for thought, though I would not call this a definitive guide, and I found the historical case studies oversimplified the issues involved. An informative book. "The other diners didn't take much notice, even when Death leaned back and lit a rather fine pipe. Someone with smoke curling out of their eye sockets takes some ignoring, but everyone managed it"
"The Klatchian waiter arrived with the bill, and placed it in front of Eath. The man was squat and brown, with a hairstyle like a coconut gone nova, and his round face creased into a puzzled frown when Death nodded politely to him. He shook his head like someone trying to dislodge soap from his ears, and walked away." "The air took on a thick, greasy feel, and the deep shadows around mort became edged with blue and purple rainbows. The rider strode towards him, black cloak billowing and feet making little clicking sounds on the cobbles. they were the only noises - silence clamped down on the square like great drifts of cotton wool. The impressive effect was rather spoilt by a patch of ice. It wasn't exactly a voice. The words were there all right, but they arrived in Mort's head without bothering to pass through his ears." 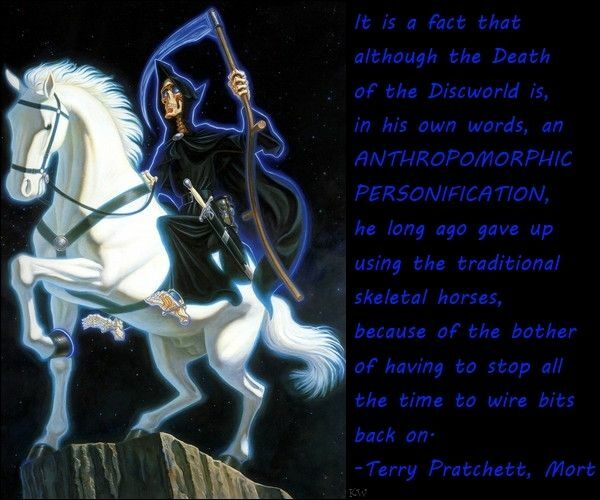 "It occurred to Mort that he ought to feel horrified, so he was slightly shocked to find that he wasn't. It was a skeleton sitting in front of him, rubbin its knees and grumbling, but it was a live one, curiously impressive but not, for stome strange reason, very frightening." I? KILL? said Death, obviously offended. CERTAINLY NOT. PEOPLE GET KILLED, BUT THAT'S THEIR BUSINESS. I JUST TAKE OVER FROM THEN ON. AFTER ALL, IT'D BE A BLOODY STUPID WORLD IF PEOPLE GOT KILLED WITHOUT DYING, WOULDN'T IT? 'Well, yes - ' said Mort, doubtfully. Mort had never heard the word 'intrigued'. It was not in regular use in the family vocabulary. But a spark in his soul told him thathere was something weird and fascinating and not entirely horrible, and that if he let htis moment go he'd spend the rest of his life regretting it." I love DEATH. 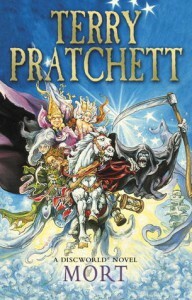 Mort was my very first Discworld novel. "... it was one of the few places on the Disc where plants produced reannual varieties. Reannuals are plants that grow backwards in time. You sow the seed this year and they grow last year. Most's family specialized in distilling the wine from reannual grapes. These were very powerful and much sought after by fortune-tellers, since of course they enabled them to see the guture. The only snag was that you got the hangover the morning before, and had to drink a lot to get over it. Reannual growers tended to be big, serious men, much given to introspection and close examination of the calendar. A farmer who neglects to sow ordinary seeds only loses the crop, whereas anyone who forgets to sow seeds of a crop that has already been harvested twelve months before risks disturbing the entire fabric of causality, not to mention acute embarrassment." "A curse, a sin, and a dark bargain with the Sidhe had condemned Caith mac Sliabhan to wander the wild woods, outcast from all humankind. Only Dubhain—a pooka, a Sidhe sprite—was his companion. Caith now was bound to do the will of the Sidhe, always fearing that his own taint would somehow make him cause pain and sorrow to others. But even an outcast like Caith could not resist taking refuge in a forest cabin, where two mysterious golden youths, a boy and girl, dwelled. "Husband and wife, we are," said the boy, but Caith could have sworn they were twins. The mysterious couple were under a spell themselves—and despite his curse, Caith felt compelled to aid them. Caith soon fell into a dark adventure that led him and the Sidhe into the evil hands of the notorious witch of Dun Glas. " 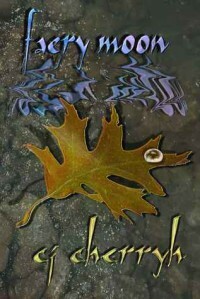 Faery Moon is an expanded and heavily revised edition of "Faery in Shadow", also including the short story "Brothers". This novel is set in the pre-Christian Schottish Highlands and makes use of Celtic mythology. The faeries in this novel aren't the light, fluffy and helpful fairies of Tolkien or any children's tale. I found the main characters to be well-written, three dimensional beings with their fair share of flaws. The relationship between the stubborn, hot-tempered Caith and the wicked and feckless, but loyal Pooka is at times amusing. This novel is rather dark, but it is delightfully written with vivid landscaping. Besides, who doesn't like Pooka tales? Faery in Shadow is a beautifully written novel, despite the issues Cherryh had with editors and publishing it. However, Faery Moon is even better and with more Caith and Dubhain. Q: How did the football cheerleader define hydrophobic on her chemistry exam? "When we are collecting books, we are collecting happiness." Deep in the black waters of Loch Ness lurks a long-necked, hump-backed monster that for centuries has fascinated those lucky--or unlucky--enough to see it. From the earliest sightings in 565 AD to the Nessie craze of the twentieth century, this creature has been steeped in the world of supernatural strangeness. Join Nick Redfern on an exciting journey into the paranormal origins of Nessie, exploring ideas that go far beyond the ordinary. This comprehensive guide offers lore, unique theories, hot spots, and photographs. Experience firsthand encounters, discover how Nessie is connected to the occult, and meet other mysterious monsters that live in Loch Ness. Nessie presents a fresh approach to the mystery, one that will take you down new and sometimes frightening paths as you hunt for the truth. " 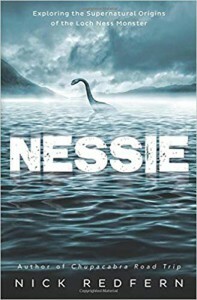 Nick Redfern has written a book that includes almost every bit of information he could find about Nessie. However, the chatty writing style isn't particularly coherent, with mulitple jumping around the time line and refering to people he had already mentioned or was going to mention later on in the book. The author also fails to provide satisfactory proof for his hypothesis, though the idea is interesting. The lack of illustrations/photographs in the books, especially when the author refers to them, is annoying. The book is interesting with new (to me) information, but flawed. Q: Why did Shakespeare only write in ink? A: Pencils confused him — 2B or not 2B? 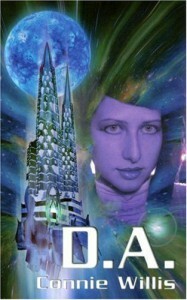 "Theodora Baumgarten has just been selected as an IASA space cadet, and therein lies the problem. She didn't apply for the ultra-coveted posting, and doesn't relish spending years aboard the ship to which she's been assigned. But the plucky young heroine, in true Heinlein fashion, has no plans to go along with the program. 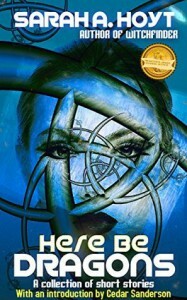 Aided by her hacker best friend Kimkim, in a screwball comedy that has become Connie Wills' hallmark, Theodora will stop at nothing to uncover the conspiracy that has her shanghaied." This is an entertaining, but not particularly substantial, short story. "For him that stealeth, or borroweth and returneth not, this book from its owner, let it change into a serpent in his hand and rend him. Let him be struck with palsy, and all his members blasted. Let him languish in pain, crying aloud for mercy, and let there be no surcease to his agony till he sing in dissolution. Let bookworms gnaw his entrails... and when at last he goeth to his final punishment, let the flames of Hell consume him forever." - Anonymous "curse" on book thieves from the monastery of San Pedro, Barcelona, Spain.